-	Perform different business management duties like organizing records and files, making reports and ordering equipment and supplies . Average annual salary of entry-level electricians in Arizona is over $36,000 while the average national salary including bonus is around $45,000. The base salary is $44,801 and bonus of $685 is provided. The total national salary sums up to around $65,000 as electricians get many benefits such as social security, 401K/403B, disability	, healthcare, pension and time-off. It largely varies depending on several factors. For example, mean yearly payment for electricians is $43,815 in Avondale, Glendale and Phoenix, $38,148 in Flagstaff and $43,524 in Tempe. When it comes to determining how much your salary will be, obvious factors such as expertise, education, the nature of job and employer comes into mind. However, there are many other determinants that need to be considered. It is expected that your level of experience will impact your pay scale. The more expertise you project at what you do, the more fee you can charge for your service. Your fee also increases as the number of years of experience increases. The school is located in Phoenix and offers a HVAC certification program. The program is 6 months in length and they offer a $0 down $0 in –school payment option. Their campus is located at 4210 E Washington Street Phoenix, AZ 85034. Stop by their campus location at 6829 N 46th Ave Glendale, AZ, 85301 and take a tour of their HVAC/BR facility. The school proudly supports military veterans and financial aid may be available to those who qualify. The school offers an occupational certificate in Air Conditioning and Refrigeration but also offer training for you to receive your Associate in Applied Science degree in Air Conditioning or Air Conditioning with STEM Emphasis. Their campus location is at 2020 S. Avenue 8E Yuma, AZ 85365. EVIT has 3 campus locations: 1601 W. Main Street Mesa, AZ 85201 as well as their East Campus at 6625 South Power Road Mesa, AZ 85212 and one at 2525 South Ironwood Drive in Apache Junction, A 85120. 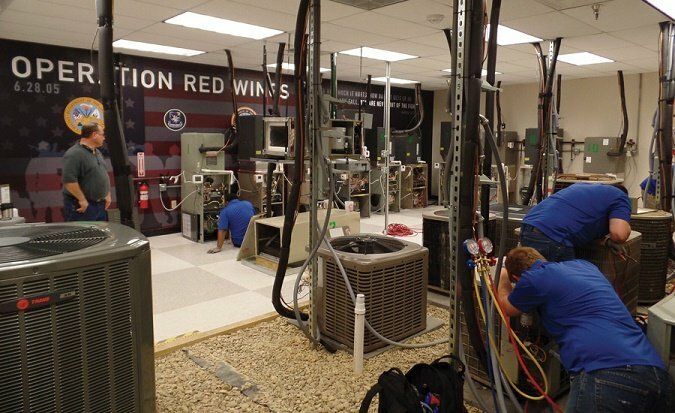 The HVAC program is 620 clock hours and can take between 10 months to a year to complete. The HVAC program offered at GateWay Community College is available at their Washington Campus at 108 N. 40th Street Phoenix, AZ 85034. You can earn either a certificate of completion or Associate in Applied Science Degree in Air Conditioning/Refrigeration/Facilities. The Heating Ventilation and Air Conditioning program at UEI is designed to get you trained in 36 weeks as an HVAC technician. Visit their Arizona campus at 9215 North Black Canyon Hwy. Phoenix, AZ 85021 . Many of the jobs found in the Phoenix metro area range from $25 to over $45 per hour and even include benefits such as paid holidays, 401K, medical and dental insurance, company truck and even company tools. Areas such as Mesa, Chandler and Glendale have similar positions available and do require you have a clear driving history and be able to pass a drug test. Employers are looking for someone that is willing to work hard, understands how to treat customers and has a clean appearance. Many of the employers we found tell us above everything what they are looking for is someone they can count on to work the hours required to do the job and be dependable. Too often they have to deal with technicians that work short hours or are constantly calling in sick. We recommend dressing professional, be clean cut with a nice haircut and no beard. Employers are looking for someone to represent their business. We also recommend that you get additional licenses that you can show your employer while on the interview. Areas such as EPA and even solar are big these days and perhaps the service you are interviewing with offers careers also in those areas. One tip is to also speak very precise as if you are taking to a client. Answer all questions they ask truthfully and give examples of different types of equipment you worked on at the trade school you attended. If possible have written reference letters from your HVAC instructors that you can provide if you just graduated.